HUNTINGTON WV – The Huntington Police Department is investigating a crash involving two, tractor-trailer trucks which shut down all westbound lanes of Interstate 64 in Huntington. Dispatchers received word of the crash at about 4:30 a.m. Thursday, October 17, 2013. The crash involved a box truck owned by the U.S. Mail and a tanker truck carrying an unspecified substance. Dispatchers said the box truck overturned due to the crash’s impact and was leaking fuel from its tanks. One of the trucks also hit a bridge and knocked off a chunk of its concrete wall. The accident happened at the 9.5-mile marker, located just east of the 5th Street Road exit in Huntington. Officials were diverting westbound traffic off the Hal Greer and 29th Street exits. Thankfully, there were no reported injuries, and unlike a May 2013 accident on I-64 in Kentucky involving a mail truck which caught fire as a result of a fuel leak, the contents of this US Postal Service truck were not destroyed and was transferred to another truck by Postal Service crews. Even so, it is a good idea to follow up with any mail sent to or from this area recently if it is of any great importance. Both of these of these truck drivers involved in this 4:30 a.m. crash illustrate the types of drivers that are most at risk for driving error due to drowsiness. In an effort to increase safety on our roadways and reduce driver fatigue, a leading factor in large truck crashes, the Department of Transportation has updated its mandates for breaks and rest periods for long haul truckers. Tired drivers are far more likely to cause accidents than those who are well rested and driving in compliance with federal trucking guidelines. Tired drivers may also enter a dangerous state known as “highway hypnosis” in which dozens of miles may pass that they do not even remember. Whether a driver falls asleep at the wheel or is inattentive due to lack of sleep, the resulting accidents can lead to catastrophic injuries and wrongful death. Under the new guidelines, drivers will have to stick to a schedule that requires taking a 30-minute break in the first eight hours of driving, cut the maximum workweek to 70 hours from 82, and “restart” those 70 hours with a 34-hour break once a week. We all recognize how dangerous driving under the influence or texting while driving is, but driving while drowsy can be equally dangerous. Sleepiness can cause slower reaction times, blurred vision, lapses in judgment, and delays in processing information. Most of us are not professional truck drivers, but drowsy driving affects us all. Get a good night’s sleep (seven to nine hours) before you begin your trip. Plan breaks into your driving schedule; don’t be so rushed to arrive at your destination that you can’t stop for rest. Stop every 100 miles or two hours for a walk, run, snack, or drink. Bring a buddy who can share the driving. If you think you could fall asleep, pull over and take a 15-20 minute nap. Avoid driving at times you would normally be asleep. Avoid alcohol and medicines that cause drowsiness. In 2010, the AAA Foundation for Traffic Safety released a study that shows that fatigue is a factor in one in six deadly crashes; one in eight crashes resulting in hospitalization, and one in fourteen crashes in which a vehicle was towed. The National Highway Traffic Safety Administration (NHTSA) estimates that drowsy driving results in 1,550 deaths, 76,000 injuries, and more than 100,000 accidents every year. Caffeine can increase alertness for several hours, but you will still need adequate rest if you want to prevent fatigue related errors. Difficulty focusing, frequent blinking, heavy eyelids. Drifting onto rumble strips, swerving in your lane. Inability to clearly remember the last few miles driven. Missed exits or traffic signs. Before we launch into the fall and winter holidays, we need to consider the potential impact of driving while exhausted could have on our own safety, our families, and other drivers sharing the road with us. Working with you to keep our families safe — The Robinette Legal Group, PLLC, Morgantown Personal Injury Attorneys serving the state of West Virginia. 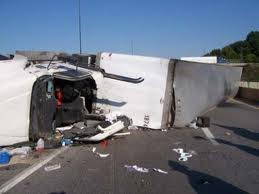 We have vast experience handling truck accident claims. If you need help with a motor vehicle collision insurance issue, call us today at 304-594-1800 or after hours, 304-216-6695.